This year, celebrate Rosh Hashanah—the Jewish New Year and anniversary of the creation of Adam and Eve—on September 29. Rosh Hashanah, which translates from Hebrew to the “head of the year,” is a two-day celebration that begins on the first day of Tishrei—the first month of the Jewish civil year—and concludes on the second day of Tishrei. During these two days, High Holy Day Services are attended, festive and delicious feasts are held, and those who celebrate ask for renewal and atonement. 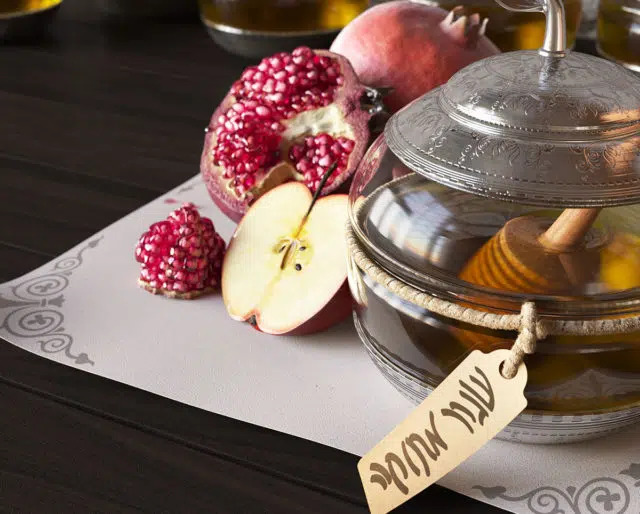 Because of its religious significance, Rosh Hashanah can be celebrated by attending synagogue, participating in prayers, and performing the Tashlikh—a ceremony in which bread is tossed into a body of water to symbolize the casting of sins into the water. As with most religious celebrations, there are specific foods that are cooked to enjoyed. For Rosh Hashanah, challah bread is eaten because it represents the continuity of life, apples are dipped into honey to embody the hope for good health and sweetness throughout the New Year, and fish heads are eaten to symbolizes a person's desire to be on top throughout the New Year. Just as you wish a person a "Happy Birthday," or offer the sentiment of a "Happy Holidays," you can pay respect to those celebrating Rosh Hashanah by wishing them the following: “May you be inscribed and sealed for a good year" in Hebrew. Specifically, to a man you would say: “Leshanah tovah tikatev vetichatem;" and to a woman, you would say: “Leshanah tovah tikatevee vetichatemee." As the first of the Jewish High Holy Days, Rosh Hashanah is viewed as an opportunity to reset and establish the tone for the next year. During this time, people are reminded to think about their past years' experiences, practice penitence, settle any debts they may have accrued, and ask for forgiveness. On Rosh Hashanah, it is a custom for a shofar (ram's horn) to be blown like a trumpet. This gesture takes place in synagogue—where most of Rosh Hashanah is spent—and reminds people of the blessed event in which God allowed Abraham to sacrifice a ram instead of Isaac, his son. During Rosh Hashanah, it is typical for people to examine themselves, repent for their past wrongdoings, and practice righteousness. Because working during Rosh Hashanah is not permitted, this provides ample time to sit and reflect on the past and set goals for the future.